T-shaped tip, fits into extrusion slot on bottom of swinging shower door to prevent water from leaking onto floor. This shower door bottom sweep is constructed from clear vinyl. It features a T-shaped insert and measures 36in. long. This seal helps contain water in your tub enclosure and prevents it from dripping onto your floors. 1. Wipe the dust on the glass surface before use. 2. Secure the seal to the glass. 4. Dry for about 8 hours to ensure it is firm before use. The clear seal that is constructed of clear silicone can be used for the bottom of the door or it can be used as a seal on the side of a door. Features:Easy to install, without adhesives. Function:Windproof, dustproof, weatherproof, energy-saving, soundproof, anti mosquito and anticollision. Use transparent ethylene material, beautiful and durable. Acid resistant, alkali resistant, not easy to corrode. 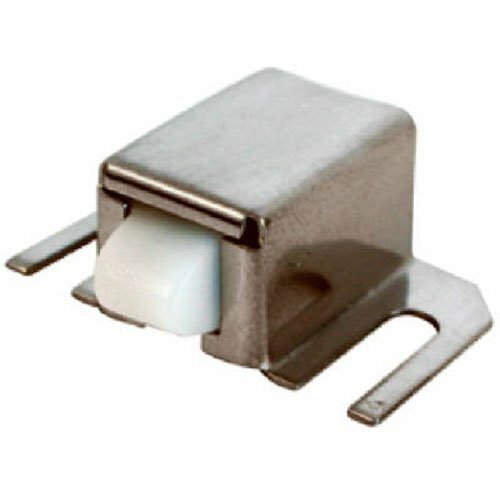 Ensure your shower doors are working perfectly with this shower door bottom guide and retainer pin. It helps retain shower door panels to the existing track, and can be used to replace existing or broken guides. It fits old style kinked shower doors and is 2 long by 9/16 wide. Made of white nylon plastic, this shower door guide is strong, durable and made to last. Plus, installation is quick and easy! Everything needed is included, including the nylon locking key and hook style guide tip. RETAIN SHOWER PANELS - Use this shower door bottom guide to help restore ease of use and aligned gliding to your shower door system. This guide also works as a retainer pin which helps retain the shower door panels to the existing track. REPLACE BROKEN GUIDES - Use this shower door bottom guide to replace existing or broken guides. EASY INSTALLATION - Installation is quick and easy and it includes everything you need, including the nylon locking key and hook style guide tip. 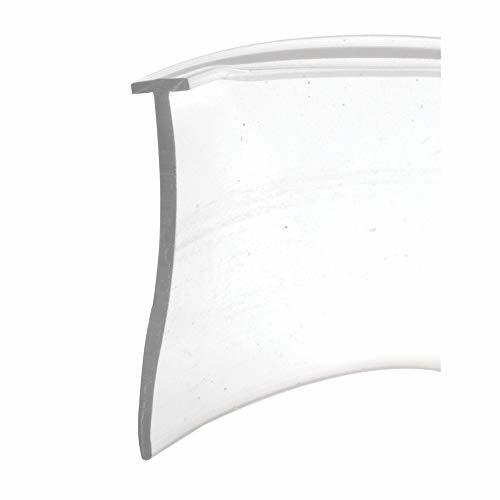 STRONG AND DURABLE - Made of white nylon plastic, this shower door guide is strong, durable and made to last. SIZING - 2 long by 9/16 wide, fits old style kinked shower doors. 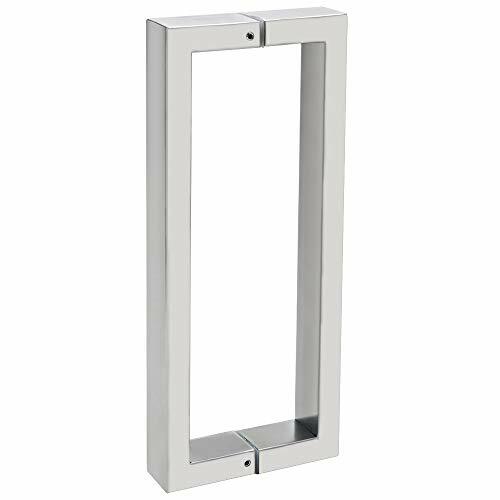 Woodbridge MSDF6076-B MSDF6075-B Frameless Sliding Shower Door, 56"-60" Width, 76" Height, 5/16" inch Clear Tempered Glass, Brushed Nickel, 60"X76"
Warranty: Limited 5 (five) year manufacturer warranty Certification: ANSI Z97.1 Certified Matching shower base NOT included. Please search Woodbridge shower base to buy separately. This shower door can be used without shower base. All measurements should be taken only after walls are finished (tile, back walls, etc.). WHY YOU NEED ELEGANT SHOWER? 1. Enjoy your shower by creating a comfy privacy space. 2. Shower glass doors frameless sliding, Keep your bathroom always in tidy and clean. 3. Stylish. Make your bathroom modernize. 4. Safety. ANSI certified tempered glass makes you far away from craking accident. 5. In-time solution. Your question will be replied within 24 hours by our experienced customer service. Adjustable Installation width: 58.5"- 60"
Dimension: 60" W. x 72" H., glass panel: 30 2/5 In ,width adjustment from 58.5" to 60" (cut top & bottom rail track to fit your size) . Hardware finish type: chrome. 1/4 (6mm) clear tempered glass- ANSI Z97.1 certified. Saftey and easy to clean. A exterior door handle provides a place to hang towels and clothes. Prime aluminium handware material resist rust and corresion. 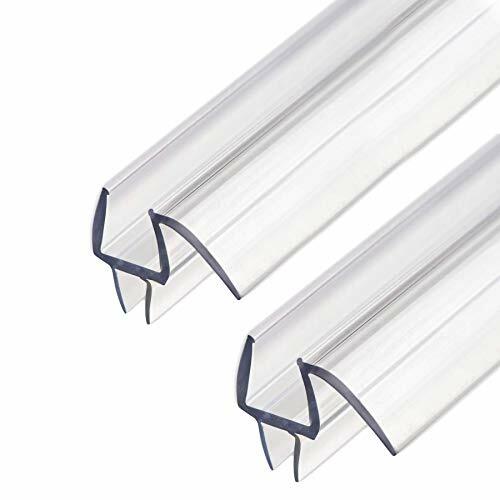 Full length clear vinyl door seals make no leakage, keep your bathroom always in tidy and clean. Limited 5 years warranty. Professional installation recommended. Luxurious Modern Design: Clean, sleek look and compliment with different styles like modern, craftsman, traditional and etc. 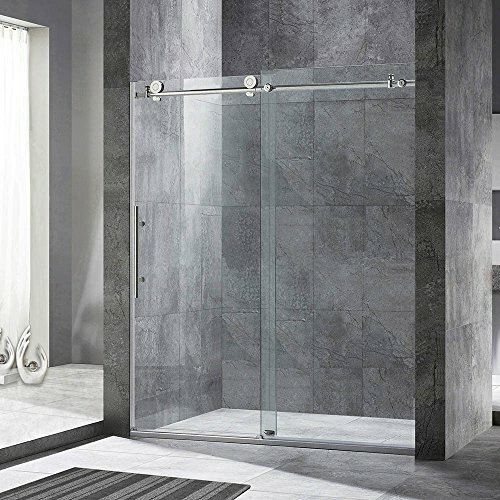 Frameless Sliding Shower Design: 44" - 48" width (adjustable) x 76" height. Door walk-in: 26 1/2". Stationary panel: 29 1/8". Glass: Premium clear 5/16" thick tempered safety glass. ANSI certified. Finish: Chrome finish. Rollers: Large solid stainless steel rollers, creating smooth and effortless sliding. quiet door operation. 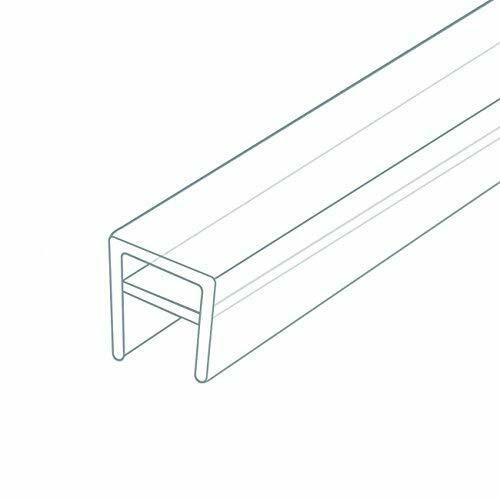 top rail support ensures wall anchoring and reinforces wall stability. Stainless Steel Construction Design: High quality stainless steel hardware will not rust, chip or scratch off. for life use. Installation Adjustment: ---- Width Adjustment: can trim stainless steel top guide bar up to 4" on the opening side---- The wall mount brackets for the structural rail have 13mm built-in adjustability: Limited 5 (five) year manufacturer Certification: ANSI Z97. 1 Certified Matching shower base NOT included. Please search Woodbridge shower base to buy separately. This shower door can be used without shower base. All measurements should be taken only after walls are finished (tile, back walls, etc. ). About Woodbridge: Woodbridge specializes in selling high quality kitchen and bathroom products since 2005 . We are committed to providing each customer with the highest standard of customer service and best value products. Please don't hesitate to contact us if you have any questions or concerns. Customer Service Phone: 562-229-0088. [ENDURACLEAN]: Stainless steel construction hardware will not rust, chip or scratch off. Shower door is easy clean, easy maintenance and that maintains its high gloss. Let you use for a long time, bright and clean as new. 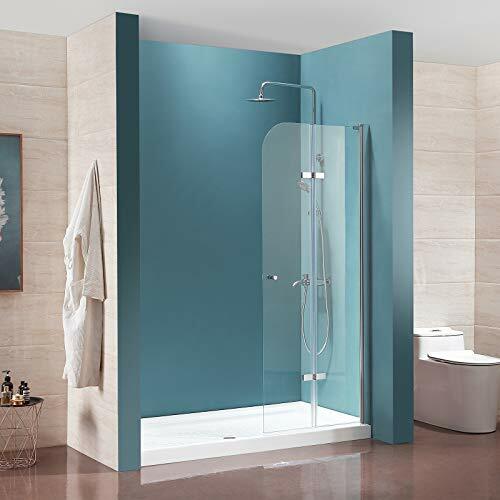 [FRAMLESS & REVERSIBLE DOOR ]: Woodbridge frameless design shower door makes your bathroom more modern and bright, also convenient to slide by using the shower door pull hand. The reversible door of the shower slides to the right or the left, depending on user preference. The doors allow for up to 3/10 of adjustability, canceling the effect of wall shift that may occur over time. This makes for an easy installation process and assurance that your product will continue to function for years to come. [ WATERPROOF DESIGN] Anti-splash threshold to prevent water spills. ( ATTENTION! ) Requires minimum threshold depth of 2 3/4 in. [PACKAGE INCLUDED]: Shower door , hardware parts box & Illustrated guide with step-by-step instructions, making installation easy. Besides, extremely solid package - firm honeycomb box is used to transport shower door, making sure a safe delivery status. [ ]: Lifetime on glass components, 2 years on hardware components , 1 year on vinyl components. Woodbridge US based product support team is happy to assist with any sales or product-oriented queries. 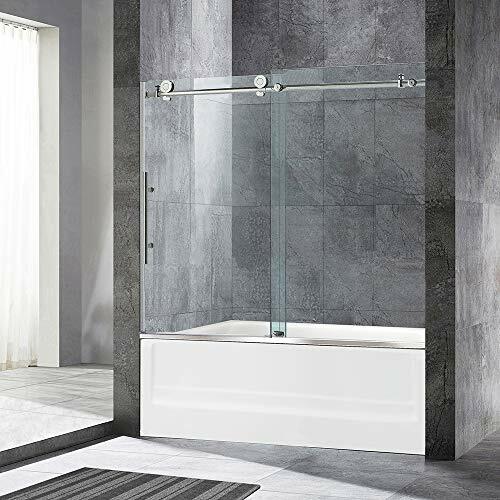 WOODBRIDGE MBSDC6076C Frameless Sliding Shower, 56"-60" Width, 76" Height, 3/8" (10 mm) Clear Tempered Glass, Chrome Finish, MBSDC6076-C, C-Series: 60"x76"
Luxurious Modern Design: Clean, sleek look and compliment with different styles like modern, craftsman, traditional and etc. 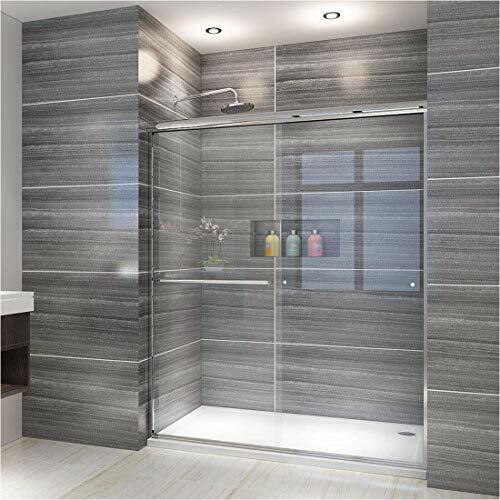 Frameless Sliding Shower Door Design: 56" - 60" width (adjustable) x 76" height. Door walk-in: 26 1/2". Stationary panel: 28 3/4". Glass: Premium clear 3/8" (10 mm) thick tempered safety glass. ANSI certified. Finish: Chrome finish. Reversible: Compatible with "right" or "left" door opening installation. Rollers: Large solid stainless steel rollers, creating smooth and effortless sliding. quiet door operation. 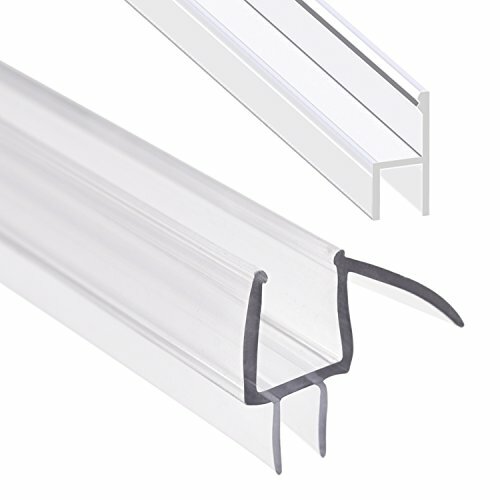 top rail support ensures wall anchoring and reinforces wall stability. Stainless Steel Construction Design: High quality stainless steel hardware will not rust, chip or scratch off. Guaranteed for life use. Installation Adjustment: ---- Width Adjustment: can trim stainless steel top guide bar up to 4" on the opening side ---- The wall mount brackets for the structural rail have 13mm built-in adjustability Warranty: Limited 5 (five) year manufacturer warranty Certification: ANSI Z97. 1 Certified Matching shower base NOT included. Please search Woodbridge shower base to buy separately. This shower door can be used without shower base. All measurements should be taken only after walls are finished (tile, back walls, etc. ). About Woodbridge: Woodbridge specializes in selling high quality kitchen and bathroom products since 2005. We are committed to providing each customer with the highest standard of customer service and best value products. Please don't hesitate to contact us if you have any questions or concerns. Customer Service Phone: 562-229-0088. ENDURA CLEAN: Stainless steel construction hardware will not rust, chip or scratch off. Shower door is easy clean, easy maintenance and that maintains its high gloss. Let you use for a long time, bright and clean as new. WATERPROOF DESIGN High quality seal strip prevent water leaking out, make bathroom outside dry and clean still. PACKAGE INCLUDED: Shower door , hardware parts box & Illustrated guide with step-by-step instructions, making installation easy. Besides, extremely solid package - firm honeycomb box is used to transport shower door, making sure a safe delivery status. WARRANTY: Lifetime warranty on glass components, 2 years warranty on hardware components , 1 year warranty on vinyl components. Woodbridge US based product support team is happy to assist with any sales or product-oriented queries. 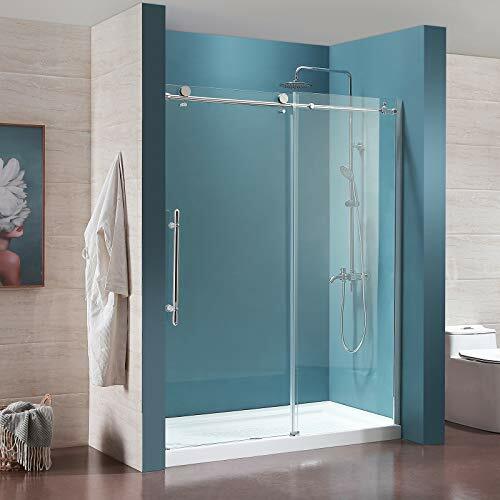 FRAMLESS & REVERSIBLE DOOR : Woodbridge frameless design shower door makes your bathroom more modern and bright, also convenient to slide by using the shower door pull hand. The reversible door of the shower slides to the right or the left, depending on user preference. The doors allow for up to 3/8 of adjustability, canceling the effect of wall shift that may occur over time. This makes for an easy installation process and assurance that your product will continue to function for years to come. 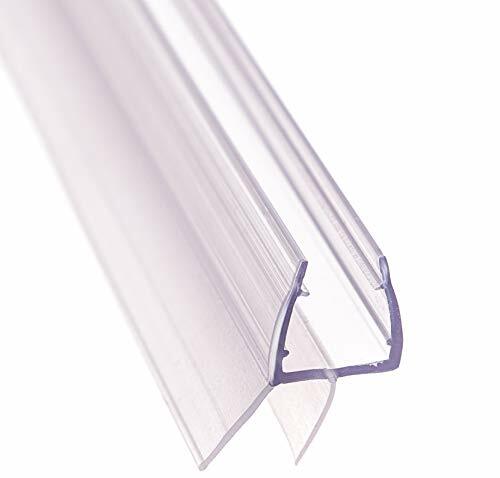 DESIGN - Frameless glass design,59.84 in.Wx75.98in.H,adjustment range 56''-60''. Simple Installation -Professional Installation Required Not Too Much Accessories, Only Need To Fix Two Ends Of Top Guide Rail and Install The Big Pulleys in The Glass Door Panel, then hang the glass door panels on the guide, very easy. FITS SHOWER BASE - Fits most standard 60 ''shower base (the base not included). 3 Year Manufacturer Warranty:Manufacturer warranty and friendly tech support to help with any questions or concerns. [ WARRANTY]: Lifetime warranty on glass components, 2 years warranty on hardware components , 1 year warranty on vinyl components. Woodbridge US based product support team is happy to assist with any sales or product-oriented queries. 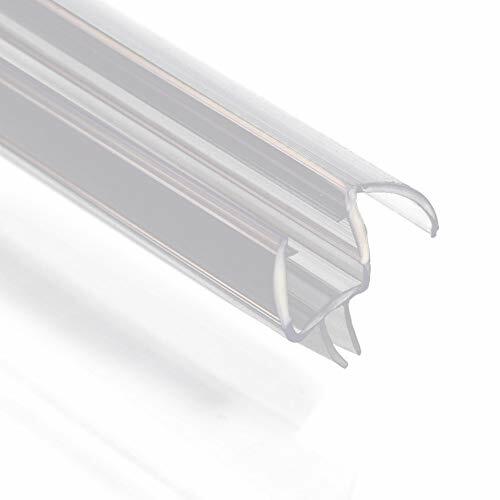 There are shower door seals that can be fitted for glasses in 1/4-Inch,5/16-Inch,3/8-Inch & 1/2-Inch thickness. 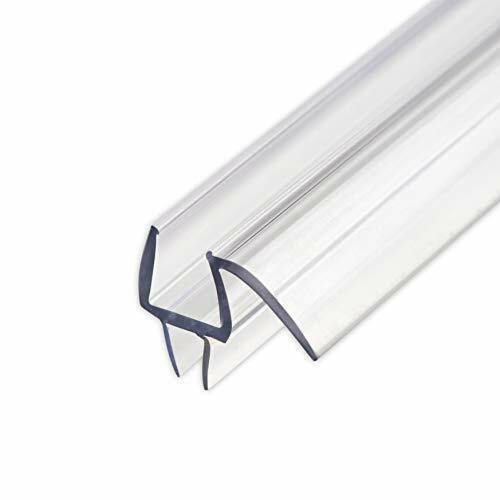 DGQ shower door seal can be cut for your own size. Delicate Brushed finish,Beautiful and fashionable,build to resist daily scratches,corrosions and tarnishing. 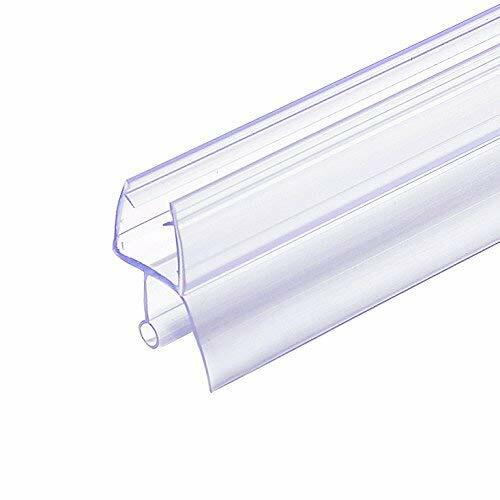 Fit 3/8" frameless heavy duty glass shower door bottom sweep seal . 28" length precuts. Do not service custom size cut, thank you. 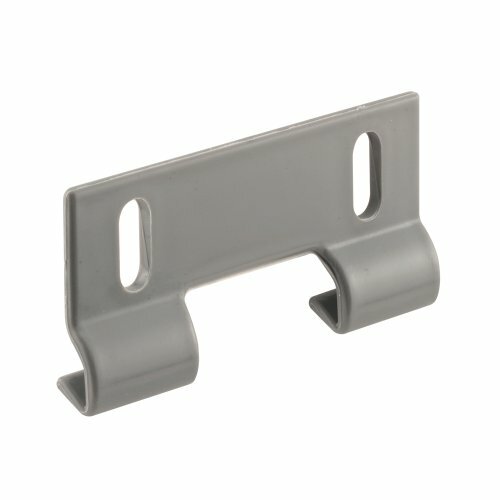 Prime Line Door Hook Guide, Bottom Mount, Suitable For Use With: Shower Doors, 3 in Overall Length, 1-1/2 in Overall Width, 5/8 in Overall Depth, Plastic, Gray, 2 in Hole Center. This shower door guide is constructed from gray plastic. It helps to keep your shower door on its track. This style guide fits on Keystone Brand and similar styled tub enclosures. Stainless Steel, Adjustable, Hinged Shower Door Latch, With Spring-Loaded Nylon Tip. DESIGN - Frameless glass door design,28.15in.Wx72.05 in.H,Walk-in Opening. 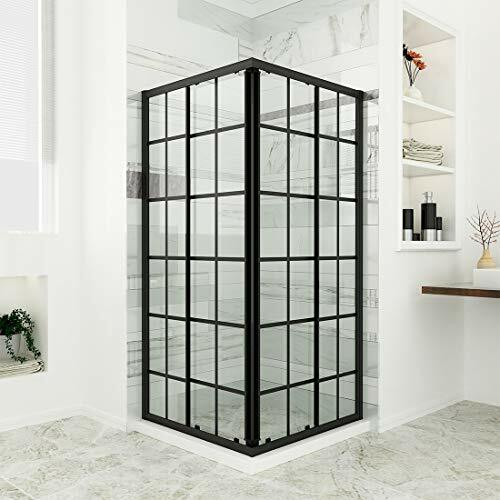 MATERIAL - 1/4(6MM) Thick Safety Clear Tempered Glass and High Quality Chrome,Hardware: Aluminum ,chrome finish,Accessories Polished Stainless Steel Finish. 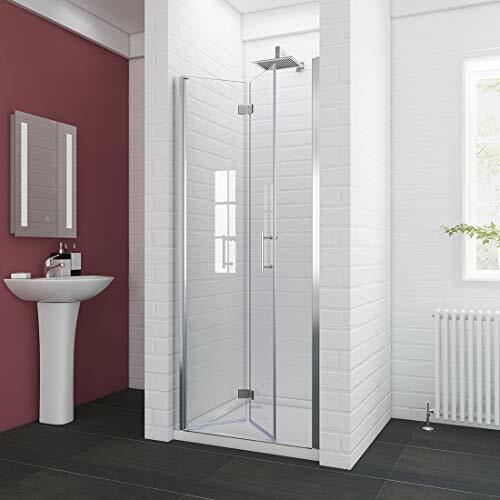 SAVE SPACE-Bi-Fold Shower Screen allows for a wide entry, while using minimal space,Great choice for smaller bathrooms. FITS SHOWER BASE - Fits most standard 32 ''shower base or larger (the base not included). MAKE YOUR DOOR CLOSE OR OPEN SMOOTHLY: Do you want a smooth sliding shower door? 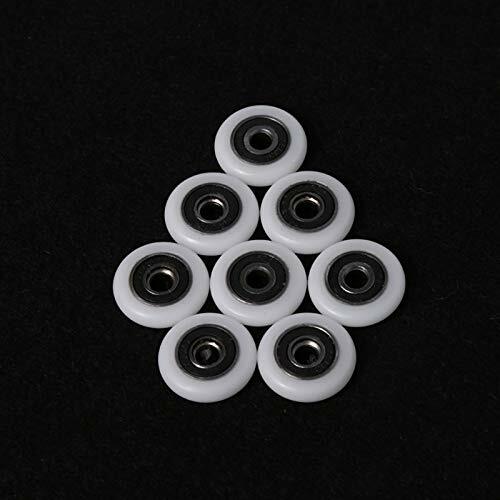 These curved sliding glass screen shower door track replacement rollers wheels bearings; Replace your shower door on its track, and it will feel like new, and should glide open and closed with just fingertip pressure. DURABLE AND STURDY BUILDING: It is made of plastic, nylon and stainless steel, 100% new high quality door rollers, maker your door slides like butter again. LOW NOISE SLIDING: The old shower door not only affects the use, but also makes noise. When you put on our new shower door roller, these bad feelings will disappear.Perfect for most shower enclosures, shower cabins and steam cabin enclosures. EASY TO USE AND SETUP: Featured with a Smart and convenience design, which means that it will take you just a few second installing this door roller effortlessly! ELEGANT double sliding shower door with a modern style, innovative design. The quality of our products is elegant, unparalleledand subordinate as to our competitors. We have teamed up with some of the top designers to make our bathrooms classy and idealistic, which offer a wide range of styles and are solely to the market. 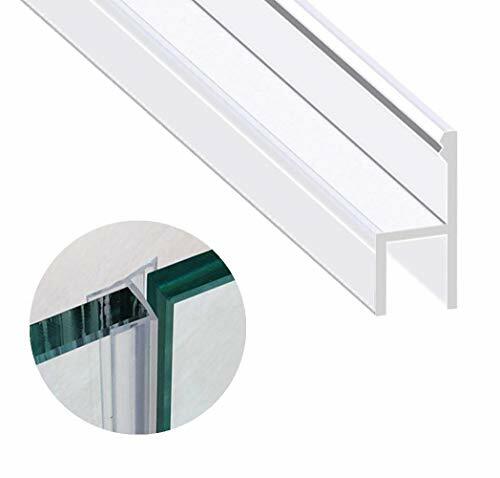 - Up- to-date universal fitting design, 3/16" clear certified tempered glass perfect waterproof and nice, Chrome finish. - All polished aluminum frame and superior hinges are made of stainless steel. - Stable frameless bi-fold shower door can be adjustable 0.79inches (20mm) on each sides. - Aluminum framed and the clear glass both on horizontal line. - Come with vinyl magnetic shower door seals strips waterproof. - Great waterproof seal strips hidden in the stable constructions, leak-proof and gorgeous. - Flexible hinges the shaft can rotate angle 180 , rotating inside or outside. - Suitable for installed in corner, or a small bathroom. - Bi-fold hinged shower door including full installation instruction and all fixings. - Pivot swing shower door is reversible for right or left door installation. Warranty period: 5 years guarantee for your peace of mind. Universal fitting design Up- to-date universal fitting design, the clear glass panel or the framed are the same height line, perfect waterproof and nice. All polished aluminum frame and superior hinges are made of stainless steel, rust resistant, creating a steady and safety structure. 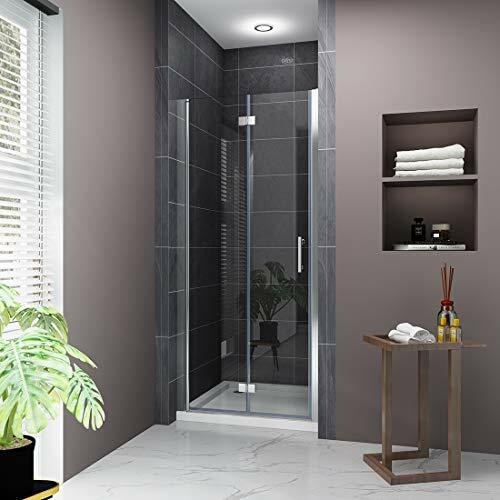 Easy to install Bi-fold hinged shower door is available fitted to left or right, easy to install, including full installation instruction and all fixings. Come with vinyl magnetic shower door seals strips waterproof guaranteed. Flexible & Saving space High quality chrome hinges are flexible, the hinges and the shaft can rotate angle 180 , rotating inside or outside. Overlapping when totally opening, saving place. Suitable for installed in corner, decorating your small bathroom. 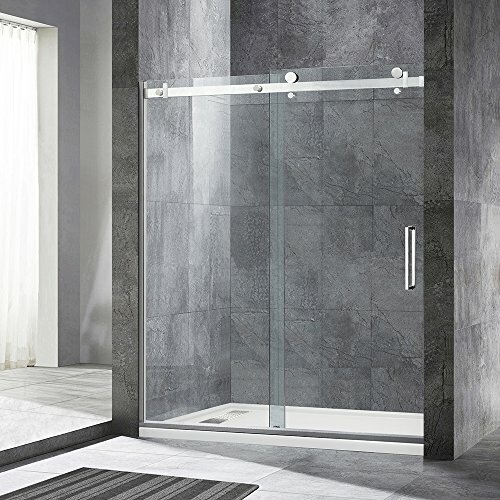 High quality guarantee Versatile design pivot swing shower door, Reversible for right or left door installation. limited 5 years warranty and professional installation recommended. SUNNY SHOWER 36" X 36" X 72" double sliding shower door adopts black screen-printing craft. The outside glass panels are shaped by square grid, no foreign body feeling at all when you touch it. Black color also makes it looks more gorgeous and fashion. The streamlined architecture gives you a study feeling, it will be more stable. It also can helps save your bathroom space. Double Opening even will makes your walk-in space more widder. Product Size - 36" W x 36" D x 72" H (Width adjustment range: 1.5"). Walk-in: 21.4". Double Sliding - Here are 2 fixed panels and 2 sliding panels. With 2 long handle plates instead of ordinary short pull handle, you can close and open the doors more conveniently. Black Screen-printing Craft - The outside glass (only one side) adopts screen printing process and shaped with square grid. Touching the surface with hands, no foreign body feeling at all. Black color also makes it looks more gorgeous and fashion. Square Shape Design - Corner shower enclosure design makes it can be installed in any corner of your bathroom, saving the space. The framed square shape also makes it more sturdy and stable. Magnetic & Waterproof Seal Strip - Two magnetic waterproof seal strips of sliding panels make the door closed more tightly so that it can prevent water leaking out. 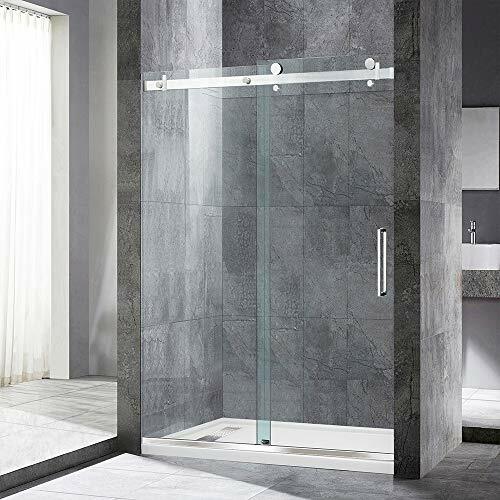 SUNNY SHOWER 32" X 72" bi-fold shower door is frameless completely, this makes it looks more simple and generous. You can swing it to 180 degrees easily to get wide walk-in range also. Meanwhile, both Left and Right installation reversible also. This hinged bi-fold shower enclosure perfectly suitable for small bathroom. Width adjustment range: 1.5" (20mm for each side). Product Size -30.5" - 32" W x 72" H. Width adjustment range: 1.5" (20mm for each side). Walk-in Width: 25.4". Space Saver - With flat mouth and flat door handle, you can swing it to 180 degrees easily to get wide walk-in range. When you open it completely, it almost seems here is not shower door, saving your bathroom space very well. Perfectly suitable for small bathroom. 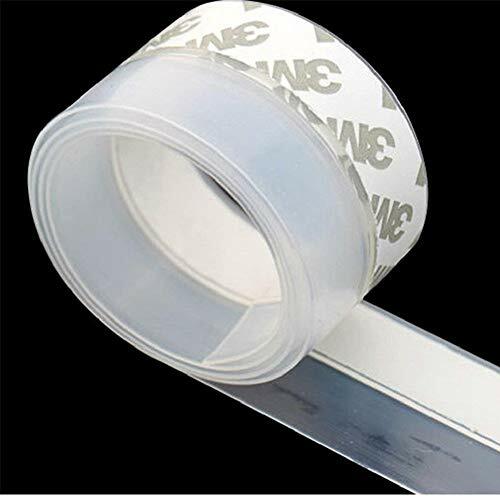 Magnetic & Waterproof Seal Strip - One magnetic seal strips installed in glass panel, one is in wall channel to make the door closed more tightly, preventing water leaking out. Glass & Shaft - The glass panel is as high as the shaft, compared to other folding doors that are lower than the shaft. This makes the top has a better waterproof effect. Meanwhile, shower door also looks more beautiful and very neat.